After winning the Nabisco Cup and guiding his club to a fourth-place league finish last season, few jobs in the J. League looked as secure as Oita Trinita manager Pericles Chamusca’s. 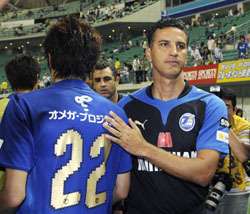 Now, effectively in limbo after being apparently sacked and reinstated in the wake of Trinita’s 13th straight defeat at the weekend, the Brazilian is not the only one wondering where he currently stands. Team official Yasushi Hara announced that Chamusca would be leaving the club after Saturday’s 2-1 loss to JEF United Chiba, only to backtrack by giving the manager a stay of execution for this weekend’s trip to Jubilo Iwata. As a gesture illustrating how far the club’s confidence has been overtaken by panic and confusion, it takes some beating. Oita defied expectations by challenging for the league title last season — heading into the final three games just two points off the top — and claimed its first silverware by beating Shimizu S-Pulse in November’s Nabisco Cup final. Trinita’s style may not have been pretty, but Chamusca drilled his side into a fearsome, ultra-defensive unit that refused to give up possession without a fight and guarded its goal with its life. That approach meant Oita scored very few at the other end, however, and its final tally of 33 was the second lowest in the entire division. Little has changed on that front this season, but the watertight defense that made up for the shortfall has been well and truly breached. Only Kashiwa Reysol has let in more goals this term, and Oita now plays every game fearing for the worst. The confidence that made it such a tough nut to crack has completely evaporated, and the sight of goalkeeper Shusaku Nishikawa bawling at his defenders with every goal conceded suggests the team spirit that Chamusca credited for last season’s success has crumbled too. Injuries have not helped, but the club’s practice of hanging unavailable players’ shirts up in the dugout has only made matters worse. The gimmick smacks of getting excuses in early, and Chamusca might as well run a white flag up alongside them for all the good it does his team’s morale. Of course loss of confidence alone cannot account for Oita’s wretched form, and a team with such a specific mandate to defend can only flourish for so long before opponents find a solution. But the mixed messages coming from the club’s hierarchy are the last thing anyone needs to hear. Although Chamusca has worked wonders in the past, a manager who has built his team on functionality over finesse should know better than anyone that results are all that count. Dismissal after 13 straight defeats would be hard to quibble with, but the current shilly-shallying is far more difficult to swallow. A manager cannot do his job properly if he does not know where he stands, and what Oita needs now is a clear plan to get itself out of the mire. Blundering on blindly will lead nowhere, and the club hardly has time to waste. One way or another, Oita needs to make a decision on Chamusca’s future sooner rather than later. After last season’s success, that dignity is the least he deserves.